Google has introduced a new feature under Google Analytics which displays the speed of the web pages and also suggest tips to optimize them. You can use these suggestions to make your web pages load faster and improve the user experience of your site. Where to Find Site Speed Suggestions? 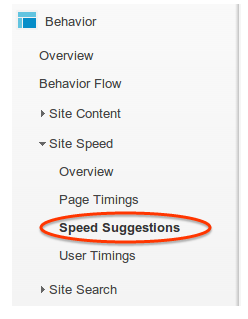 You can find the site speed suggestions under site speed section in behavior tab in Google Analytics. The speed suggestions section displays 4 columns namely Page, Pageviews, Average Load Time, Page Speed Suggestions and Page Speed Score. The page speed suggestions column displays the page speed insights report and scope for improvement. It also displays a score in the range 1-100, the more the score the better the speed. Why Optimizing Speed is Important? Page speed is an important factor for search experience optimization. Users are more likely to spend time on the site which loads faster as opposed to sites which takes time to load. Hence, this extremely useful feature will help the webmasters to take actions on slow pages of the site in order to improve the search experience of the user. When Should You Use Fetch as Google? How to Boost Up the CTR of Your PPC Campaigns? How to Fix a Disapproved Ad in Adwords?